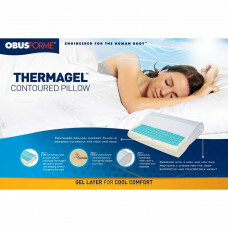 Deluxe high-density memory foam is fused with an advanced Thermagel gel layer to provide cool comfort throughout the night. Contoured cervical support pillow is designed to cradle the neck and head. Reversible high and low ends to provide choice of most comfortable and supportive height.